Cook once, with a twist for lunch. Cook an amazing dinner as usual then create a new twist on the recipe to create something different for lunch the next day! 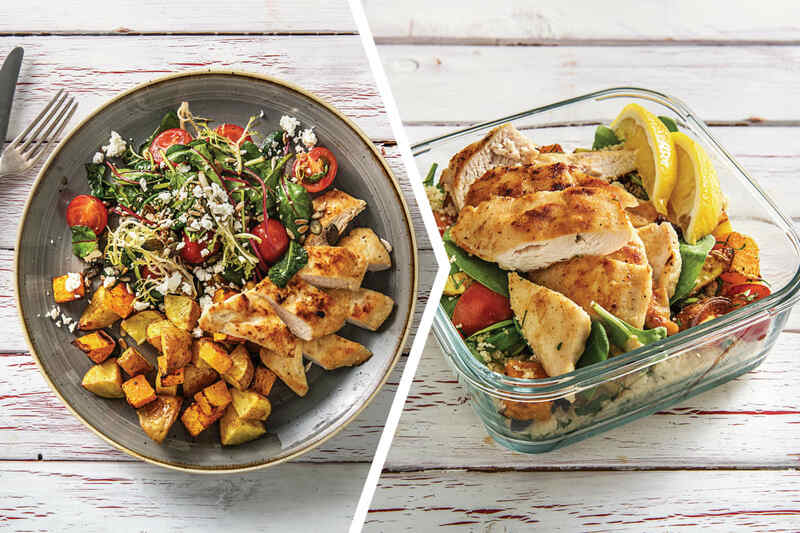 Enjoy tender chicken, roasted veggies and fetta for dinner, then pack up a spinach and chicken couscous bowl for lunch. Extra delicious! The Nutritional Values table below is only for the dinner portion. 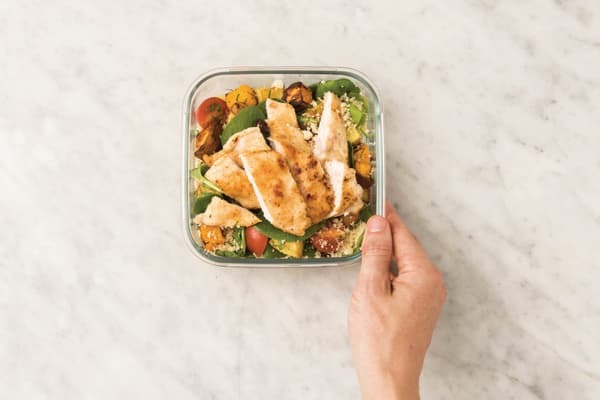 The Nutritional Values for the lunch portion are as follows: 2170kJ Energy, 9.2g Fat, 2.7g Saturated Fat, 63.4g Carbohydrate, 16.3g Sugars, 41.9g Protein, 436mg Sodium. Preheat the oven to 220°C/200°C fan-forced. Cut the potato (unpeeled) into 2cm chunks. 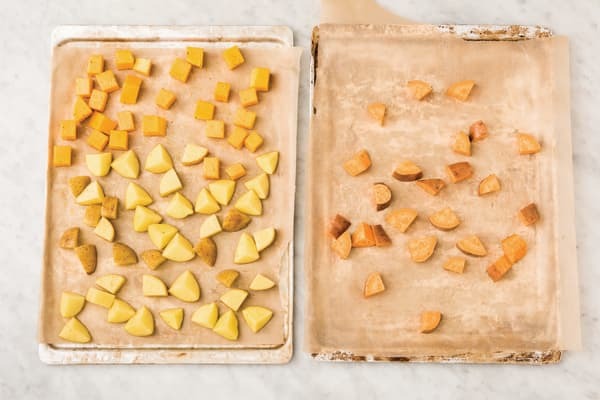 Place the potato and peeled & chopped pumpkin on an oven tray lined with baking paper. Cut the sweet potato (unpeeled) into 2cm chunks. Place on a second oven tray lined with baking paper. Drizzle both trays with olive oil and season with salt and pepper. Toss to coat, then roast until tender, 25-30 minutes. While the veggies are roasting, slice the cherry tomatoes in half. Finely chop the garlic (or use a garlic press). 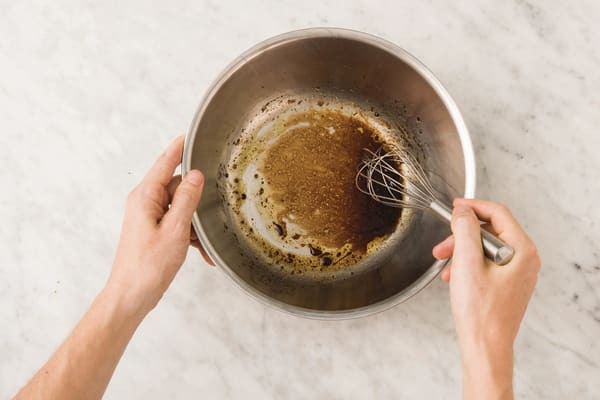 In a large bowl, combine the balsamic vinegar, olive oil (2 tsp for 2 people / 1 tbs for 4 people) and a pinch of salt and pepper. In a medium saucepan, heat a drizzle of olive oil over a medium heat. 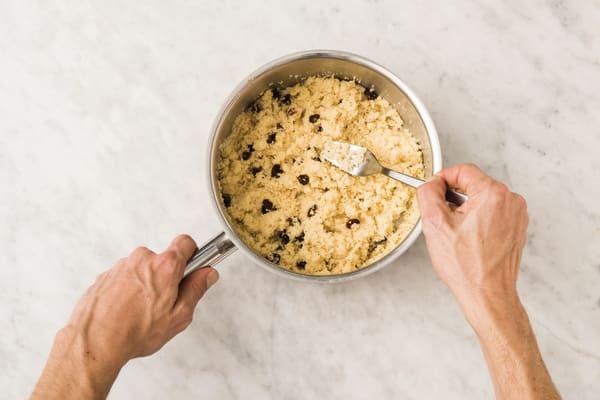 Add the garlic and currants and cook, stirring, until fragrant, 2 minutes. Add the water, crumble in 1 chicken stock cube and bring to the boil. Add the couscous and a drizzle of olive oil. Stir to combine, cover with a lid and remove from the heat. Set aside until the water has absorbed, 5 minutes. Fluff up with a fork and set aside, uncovered, until time to pack lunch. 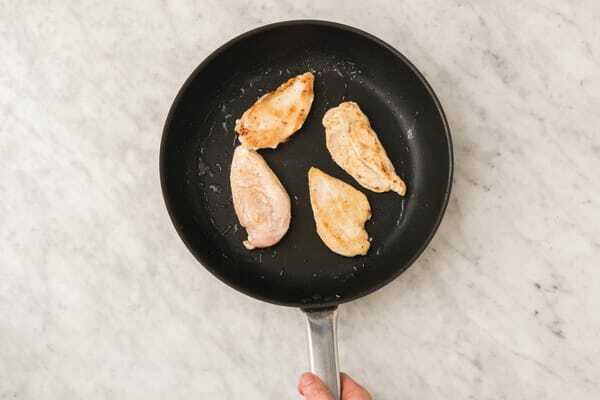 While the couscous is cooking, place your hand flat on top of each chicken breast and use a sharp knife to slice through horizontally to make two thin steaks. In a large bowl, combine the salt, plain flour, sweet mustard spice blend and a pinch of pepper. In batches, add the chicken to the flour mix, toss to coat and transfer to a plate. Heat a large frying pan on medium-high heat with a drizzle of olive oil. When the oil is hot, add 1/2 the chicken and cook until golden and cooked through, 3-5 minutes each side. Transfer to a plate to rest. Repeat with the remaining chicken. Add the mixed salad leaves and cherry tomatoes (reserve a handful for lunch!) to the bowl with the balsamic dressing and toss well to combine. Thickly slice the chicken and reserve two portions for lunch. 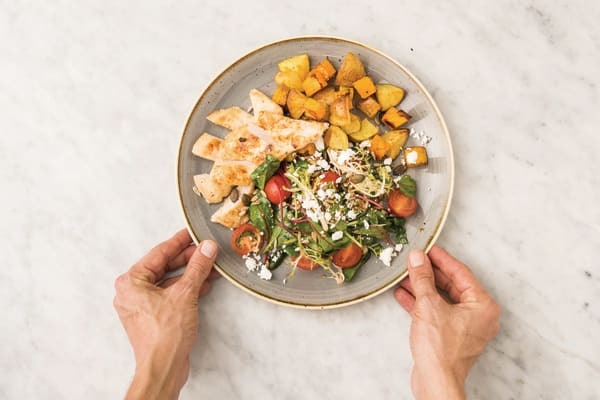 Divide the salad, remaining chicken and the roast pumpkin and potato between plates (set the sweet potato aside for lunch). Sprinkle the salad with the roasted seed mix and crumble over the fetta. When you're ready to pack your lunch, slice the lemon into wedges. Roughly chop the parsley. Combine the couscous with the parsley, sweet potato, baby spinach leaves, reserved cherry tomatoes and a pinch of salt and pepper. Toss well to combine. Divide the couscous between two microwave-safe containers and top with the reserved chicken and a lemon wedge. Refrigerate. At lunch, remove the lemon wedge. Microwave for 2-3 minutes or until heated through and season to taste with salt, pepper and a squeeze of lemon.